The INCLUDiT V Conference will include communications from the different thematic areas, with plenary sessions with Keynote Speakers, parallel sessions for presentation of communications, and a poster presentation session. The presentation and publication of papers in the Proceedings Book are conditioned to the registration in INCLUDiT of at least one of the authors and the presentation of the communication in the event. Best papers will be published in a scientific journal. Each registered author / co-author can submit / submit a maximum of two papers. Full papers are intended to present scientific research resulting from academic work, projects and experiences. Submission of papers is done in the easychair platform (available soon). Articles must have between 6 and 10 pages and must comply with the template provided. The Posters aim to disseminate research, projects, experiences and materials, which will be presented in a specific session for this purpose. Its authors will have the opportunity to share knowledge and informally discuss their work with conference participants. Posters accepted for submission to INCLUDiT V must be pre-prepared, printed and posted by the author at the beginning of the first day of the conference and withdrawn by the end of the conference (non-withdrawn materials will not be stored by the Organization). 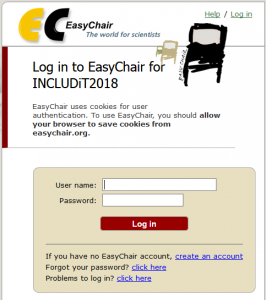 The poster abstract submission is made in the easychair platform (available soon). Poster abstract must have 1 page and must respect the template provided. Paper or posters Proposals should be submitted through the easychair platform (click here or in the image below).